British actress Zena Moyra Marshall was born on New Year's day in 1925 in Nairobi, Kenya. After appearances in a number of films including Caesar and Cleopatra, Three Cases Of Murder, Helter Skelter and The Lost People, Marshall secured an enduring spot in film and 007 history in 1962 by playing the role of Chinese SPECTRE agent Miss Taro alongside Sean Connery in the first ever James Bond film Dr No. 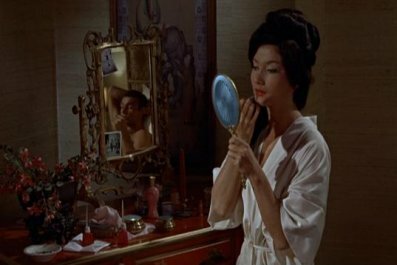 Marshall's femme fatal performance as the scheming Miss Taro made for some memorable moments with Sean Connery and the subsequent incredible success of the Bond series meant that this enjoyable role would never be forgotten by fans, both old and new alike. Later roles for the exotic actress included parts in Those Magnificent Men in Their Flying Machines, The Switch, television work in the likes of Danger Man, and a big screen farewell in the sci-fi film The Terrornauts. Marshall retired from acting in the late sixties to concentrate on her family and private life but remained a big participant and supporter of James Bond events and celebrations. She passed away on Friday 10th July 2009 at the age of 84.